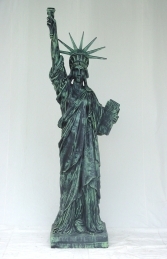 Add a slice of the American dream to your wall with this Statue of Liberty wall decor head. Nothing else says America like this 3D wall décor. Perfect for creating the final touches to any American style room, from a bedroom to a diner. You could even use this to make a feature and draw the attention to your special promotion or offer. Hangs on the wall with a simple ‘s’ style hook which we can supply with the model. Not enough room for the full size Statue of Liberty? Then this is perfect for you!